Writing WordPress plugins and themes is my kind of fun, really. Adhering to the WordPress PHP Coding Standards while doing that is not only even more fun but also helps “…maintain a consistent style so the code can become clean and easy to read at a glance”. Here is how I managed to get automated tests against the WordPress coding standards up and running in Sublime Text on a Mac using Homebrew and Git. PHP_Codesniffer contains two PHP scripts. The main phpcs script detects violations of a preset coding standard, phpcbf can automatically correct those violations. After Homebrew is done installing php-code-sniffer it suggests to verify the installation by running phpcs --version. If you get a nice PHP_CodeSniffer version 3.0.2 (stable) by Squiz (http://www.squiz.net) response when running that command you are ready for the next step. PHP_CodeSniffer comes included with a bunch of coding standards which are really not of much use to us in this context. To be able to check code against the WordPress coding standards, install them by cloning the PHP_CodeSniffer rules somewhere on your machine. I keep my Sublime Text plugins and other stuff in a synced folder (Example) so that is where I cloned the repo. Any location will do fine though. // The path to the phpcs executable. 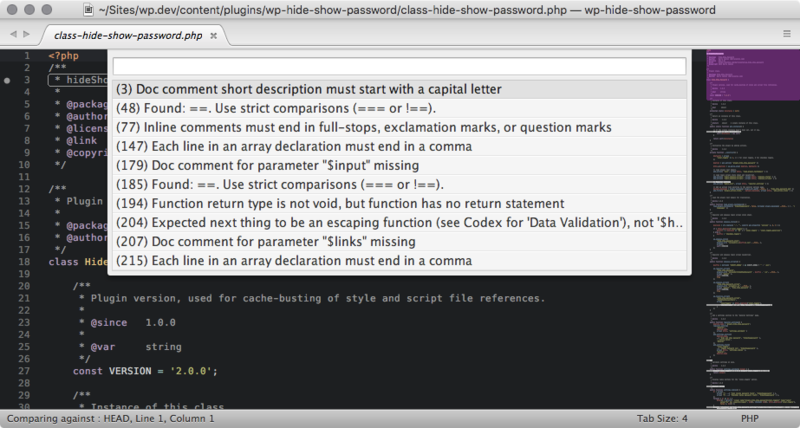 // Tell phpcs to use the WordPress standard by default. // Run phpcs on each file save. // Show annoying panel whenever an error is found. // script which can automatically fix errors. // ...and where to find the beautifier executable.